Venue: Twickenham Date: Saturday, 28 November Kick-off: 17:30 GMT Coverage: Commentary on BBC local radio via the BBC Sport website and app, plus live scores online. Ben Franks hopes his first return to Twickenham on Saturday since the World Cup final will mark a perfect start to his London Irish career. New Zealand prop Franks is set to make his first start for the Exiles against Wasps in the London double header. The 31-year-old played the closing 22 minutes of the 34-17 victory against Australia less than a month ago. "I've never played anything other than a Test at Twickenham, so that's going to be exciting," he told BBC Sport. Franks, capped 47 times by his country, made four appearances during the World Cup. The former Wellington Hurricane admitted the atmosphere around the tournament was markedly different than in his home country four years previously. "It felt like we were in our own little bubble," he said. "There was less pressure than in New Zealand, when the whole country was living and breathing every second of it, and it was like being inside a pressure cooker. "We were out of the way and just went about our business for the first four to five weeks. Then from the quarter-finals onwards, it just flew past. "The final itself was pretty unique as both sides came out and played running rugby, which made it very exciting." 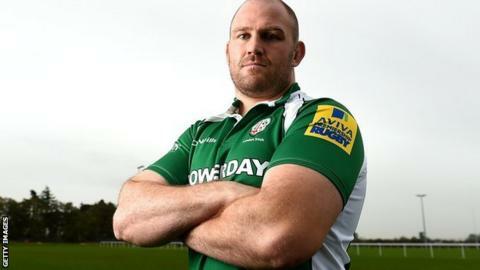 Now the focus for the older of the two front-row siblings - brother Owen started the World Cup final - has shifted from lifting the Webb Ellis Cup to making an impression with Tom Coventry's London Irish in Premiership rugby. "I felt I'd achieved all there was to in New Zealand having played over 100 Super Rugby games," said Franks. "I'm good mates with Brad Thorn (former All Black second row) and he told me I would enjoy playing in England. "The family were really excited about coming over here, probably more so than me at times, and they've jumped right into the culture and got involved." And why choose London Irish as the place to make that switch? "What stuck out for me was the club have been at a point for a while where they feel they've underachieved," he replied. "What they've done with the training facilities and the desire they have to be one of the top teams excited me. "When they talked to me about the move, I could easily see myself buying in to what they want to achieve."